Standzout is proud to announce that their newest product, Helix Apple Watch Dock, is now raising funds on Kickstarter. Helix is a compact housing for the Apple Watch charging cable and USB charger that makes charging Apple Watch simple and easy, and taking it to go even easier. Helix is the first of its kind, an Apple Watch accessory thoughtfully designed to fit the way people are using and charging the Apple Watch. Helix uses the USB charger and magnetic charging cable that comes with the Watch to create a charging platform that plugs directly into an outlet. It eliminates the clutter of an extra charging cable, making it the perfect product for travel or home. Helix is easy to use: simply wrap Apple Watch's charging cable around the barrel, insert the charger, and plug it in. It is compatible with any of Apple's one- or two-meter magnetic charging cables. "The last thing any of us needed in our lives was another cable," says Helix co-founder Blake Frazier, "Helix is the solution that makes it easy to grab your charger and go. No mess, no tangles, no fuss." Helix was built on real-world testing of the Apple Watch, observing the way that users are interacting with and charging the device, and carefully considering feedback. "Once we had the Watch in hand, we quickly realized that the nightstand isn't necessarily the only place to charge Apple Watch," says Brandon Barnard, Standzout CEO, "Helix lets you charge wherever works best for you, and keeps another charging cable off of your already-cluttered nightstand." 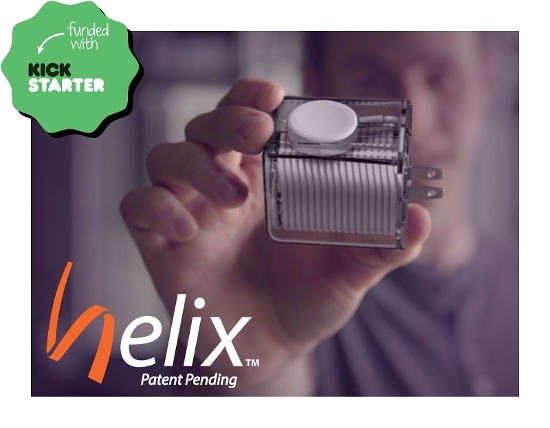 The Kickstarter campaign for Helix will be live until Wednesday, Sept. 2, 2015. Backers of the project can pick up a Helix in any of three colors — black, white, or clear — at reduced Kickstarter-only prices. Helix is designed, tooled, and manufactured in the USA. Standzout, formally a business of Aspire Innovation LLC, is the creator of the Helix Dock for Apple Watch, Bandstand Apple Watch Dock, Standzfree Tablet Floor Stand, Surmount Tablet Clamping Mount, and Wallmate Tablet Wall Mount. Doing business from Evansville, Indiana, Standzout's goal is to create accessories that allow people to get the most out of their mobile devices. 0 comments on "Helix Dock for Apple Watch Launched on Kickstarter"